At our monthly meetings we hold a fish show—called a “Bowl Show.” This is an opportunity for our members and guests to bring in their fish from specific classes to be judged as they would be in an actual fish show. In each category, a First, Second, and Third place winner is chosen and a point value is awarded to participating members. Points earned from placing and participating each month accumulate throughout the year and at the year’s end, the title of “Bowl Show Champion of the Year” along with a plaque is awarded to the member with the most accumulated points. 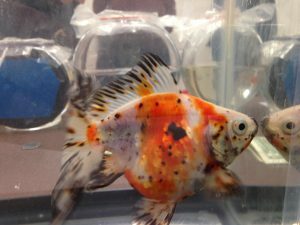 Your fish, aquatic animal, or plant should be displayed in a clear bowl, small animal carrier, container or tank of appropriate size, ideally with a contrasting background/bottom and a flat front side for easy viewing/judging. It’s also a good idea to have some form of lid for your animal’s protection. Keep in mind bringing your animals in a “Styro”, Thermal, or cooler will help protect them from the elements and make transport easier. The charge for each entry is only $ .25.